44 fueling stations are expected to be operational by the end of 2015, with another 6 coming on line in 2016. Deployment of fueling stations may fall short of the need sometime after 2018, despite the state’s pledge of funding of $20 million annually. Direct comparisons of fleet size between the 2014 and 2015 reports are tricky since the 2014 report estimated the fleet size in 2020 while this year’s report estimates fleet size in 2021. Yet CARB felt safe in concluding “The 2015 auto manufacturer survey results suggest the FCEV market may grow faster than previously projected . . . ,“ with fleet size nearly doubling between 2020 and 2021. 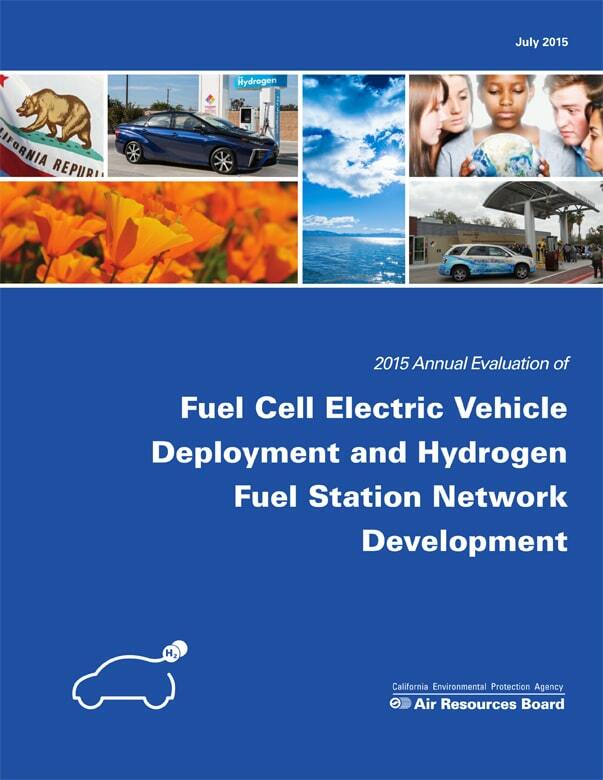 The latest estimates are well short of projections made at the beginning of the decade by the California Fuel Cell Partnership, which surveyed its members for several years. 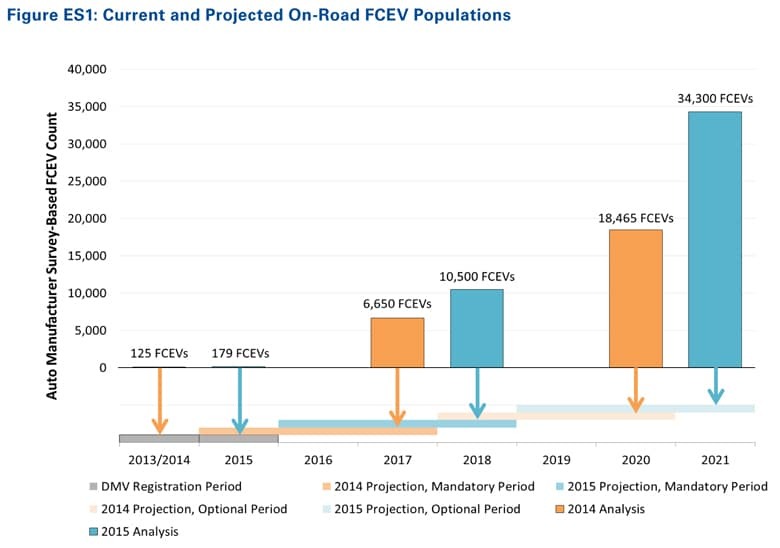 Its 2012 report, for example, estimated more than 50,000 FCEVs would be on the road by 2017. This is higher than the current estimate by a factor of eight. The higher estimates were made Daimler Benz and General Motors were still committed, more or less, to commercialization in 2015. CARB expressed concern over several aspects of station development. “After 2018, the number of vehicles expected to be on the road may need more fuel than can be provided by the number of hydrogen stations that can be built with currently available public funding, assuming funding levels and station capacity remain unchanged,” the agency concluded. But CARB stopped short of publicly advocating additional state subsidies: “Addressing the expected gaps in hydrogen capacity and coverage may require exploring innovative actions to maximize the utility of public investment and rapidly accelerate industry momentum to expand the fueling network.” This caution suggests that the question of state support for hydrogen stations remains a delicate one politically, and recent reports of problems at the existing stations will complicate matters further. CARB concluded that “Station technical capabilities must continue to advance to satisfy customer expectations for a retail fueling experience, including meeting current fueling protocols and expanding capacity to fuel growing numbers of FCEVs.” The agency did note that some stations are fully commercial today, with approved hydrogen metering systems that allow fully transparent customer purchases. In most cases today the auto manufacturer is covering the cost of fuel while the metering technology is developed, deployed and tested.